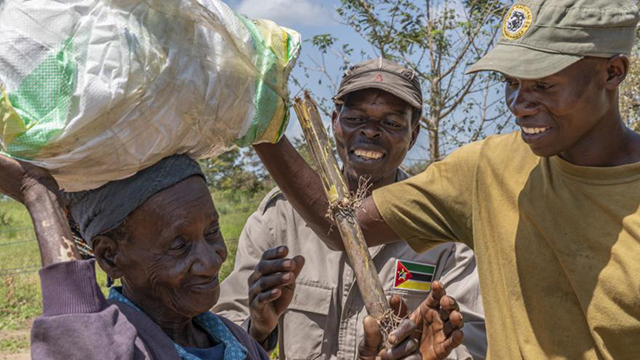 The Gorongosa Restoration Project in Mozambique–a long-time Half-Earth Project partner–continues to be an exemplary world leader in biodiversity restoration and management in ways that benefit local communities. This article originally appeared in The New York Times on April 9, 2019. Here’s some news you may have missed. Southeastern Africa got hit in March with a cyclone that United Nations officials say was one of the worst weather disasters to ever strike the Southern Hemisphere. “Ever” is a long time. My friend Greg Carr, who runs the Gorongosa National Park in Mozambique, told me that the lions, elephants and zebras sensed the storm coming and moved to higher ground to avoid the flooding. While this historic weather disaster was unfolding, President Trump was urging Republicans not to kill the Democrats’ Green New Deal proposal — not because Trump wants to work with it, but because he wants to run against it in 2020. Trump wants to take the Green New Deal, co-sponsored by Senator Ed Markey of Massachusetts and Representative Alexandria Ocasio-Cortez of the Bronx, and mock its aspiration to urgently decarbonize our electric grid, transportation sector, industries and buildings, while pairing all that with programs to ensure that every American can get a job and have access to health care and “safe, affordable, adequate housing,” as well as other social goods. She is right. And given the choice between a “Green New Deal” that envisions scaling justice for all and Trump’s “Black New Deal,” which protects profitable pollution for the 1 percent, my heart is with the greens. But my head says you can’t transform our energy system and our social/economic one at scale all at once. We have to prioritize energy/climate. Because for the environment, later will be too late. Later is officially over. And if Democrats approach this right — with a barrage of political ads paired with a focused green strategy, like the “Green Real Deal” proposed by Ernie Moniz, Barack Obama’s energy secretary, and Andy Karsner, George W. Bush’s assistant energy secretary for renewable energy — they can win on this issue in 2020 and make Trump the laughingstock. The Department of Energy’s 2017 U.S. Energy and Employment Report revealed that solar energy was employing more workers than the traditional coal, gas and oil industries combined. But Trump says he prefers big, beautiful coal. How do your kids feel about that? The heartland of America’s wind energy system today is Texas, Oklahoma, Kansas, Wyoming, North Dakota and Iowa, which all voted for Trump in 2016. But Trump says noise from wind turbines “causes cancer.” Do you buy that? Cyclone Idai devastated some of the greatest wilderness areas in Africa. Trump couldn’t care less. Do you? Because another decade of storms like that, and the only lions, elephants and zebras your grandkids will ever see will be in a Disney movie. Newsweek just reported that a study published in the journal Nature found that the replenishment of new coral in Australia’s Great Barrier Reef, one of the true natural wonders on our planet, “fell by a staggering 89 percent following two severe mass bleaching events in 2016 and 2017, which were caused by significant spikes in water temperature. The two bleaching events were the worst in recorded history, leading to a catastrophic die-off in many regions of the 3,800 individual reefs that comprise the world’s largest reef system.” Your grandkids may never see a real coral reef. Trump couldn’t care less. Do you? I’d pound Trump with these points, but they will be effective only if married to a “Green Real Deal.” For Moniz and Karsner, that would involve every state or city adopting its own version of a plan California approved last year called S.B. 100. S.B. 100, which was spearheaded by State Senator Kevin de León, an unsung hero of the green movement, mandated that power companies steadily increase carbon-free electricity on their grid until it reaches 100 percent by 2045. The law sets a steadily rising standard for California power generation companies: 50 percent renewables by 2026, 60 percent renewables by 2030 and 100 percent carbon-free — so as to include energy sources that aren’t actually renewable, but don’t emit carbon dioxide — by 2045. So wind, solar, geothermal, biomass, large hydro, nuclear power and natural gas paired with carbon capture and storage (C.C.S.) can all play, plus whatever new clean power gets invented. And the steadily rising California standard guarantees they’ll all have a growing market to sell into. A Green Real Deal would be a nationwide effort to inspire and enable Democrats and sensible Republicans to come up with state and local versions of S.B. 100 and thereby stimulate America’s earth race — not space race — to get to national net-zero emissions by 2045, or earlier. It could garner a lot of G.O.P. support in wind states, businesses could make money off it, and it would put Trump totally on the defensive. I repeat: Later will be too late. So let me end where I began — with Greg Carr in Mozambique’s Gorongosa Park, one million acres of wilderness, which has been protecting both wildlife and the 200,000 people living around it. It was also Carr’s 260 park rangers who delivered 100,000 pounds of food, rescue teams and new seeds for replanting flooded crops to all the villagers living around them. (To help, go to gorongosa.org/cyclone_relief_fund.) Carr wants to see national parks in Africa transformed from just tourist sites to economic development engines, absorbers of climate change and first responders to disaster. Low-lying coastal cities in America should be thinking the same. Nine out of 10 homes in Beira — Mozambique’s fourth-largest city, on its coast — were devastated by Idai. Gorongosa is upstream from Beira and absorbed enough water to prevent that port city from being wiped off the face of the earth, Carr said. A Green Real Deal — if framed and focused properly — could wipe that smirk right off Trump’s face. Thomas L. Friedman is the foreign affairs Op-Ed columnist. He joined the paper in 1981, and has won three Pulitzer Prizes. He is the author of seven books, including “From Beirut to Jerusalem,” which won the National Book Award. Half-Earth Day 2018: Laura Macamo, Gorongosa Restoration Project, Mozambique from EOWilson Biodiversity Foundation on Vimeo. Gorongosa Restoration Project, Dominique Gonçalves, Half-Earth Day 2017 from EOWilson Biodiversity Foundation on Vimeo. E.O. Wilson Biodiversity Laboratory at Gorongosa National Park from EOWilson Biodiversity Foundation on Vimeo.